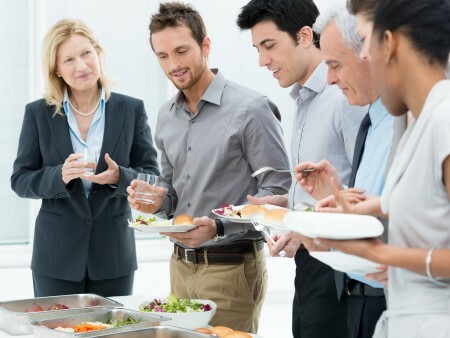 My office is having a holiday potluck next week – do you have any tips to make sure I don’t do anything that will make my co-workers sick from eating my food? The best way to make sure that doesn’t happen is to adhere to good food safety guidelines. In fact, it’s a good idea to adhere to good food safety guidelines anytime you prepare food – whether it’s a small dish just for yourself or a meal you prepare to share with others. When deciding what to bring, consider foods that don’t require temperature control such as baked goods or pre-packaged snacks. Make foods that are easy to serve with utensils to limit the need for hands to come in direct contact with the prepared food. If you make a dish that is prepared off-site, make sure that you transport the food in a covered container to prevent contamination. Cold foods should be kept in a cooler with ice or gel packs to keep the foods cold during transportation. If you are bringing hot foods, make sure you use an insulated container to keep the foods hot during transportation. Use a slow cooker, chafing dishes or other types of warmers to keep hot foods above 140 degrees throughout the potluck. Perishable foods — especially meat, poultry, seafood and eggs — should not be left at room temperature for more than two hours to help ensure that the food doesn’t enter the “danger zone” -- between 40 and 140 degrees, where bacteria multiply rapidly.